Ok before we move on with the tie-breaker, a little bit of thought into why a gear linkage system can be more effective - if setup correctly for the bike's actual requirements - than a normal simply gearlever fixed directly onto the shifter rod. maybe the following diagram might help: imagine the green part as the gear lever, to which one end of the linkage rod attaches. the red dot marks the center around which the gear lever rotates. the long back one is of course the linkage rod. and the yellow part, that's the gear shifter fixed to the shifter shaft, the center of which is marked by that blue spot. now the black arrow pointing downwards onto the gear lever - that's the force exerted by the rider. let it be F1. now as you can see, the force F is exerted at a distance L1 from the red center. so the "moment" or "turning force" about the center(red dot) is (L1 X F1). now we have the linkage rod which translates the "moment" into a linear force and exerts a pull on the gear shifter. now the force transmitted through the linkage rod, say F2, is equal to (L1 X F1) / L2. in other words, F2 = F1 X (L1 / L2). which means, we have introduced a multiplication factor here - provided L1 > L2, the force F1 is boosted by the ratio L1/L2. ok so a boosted force hits the gear shifter. 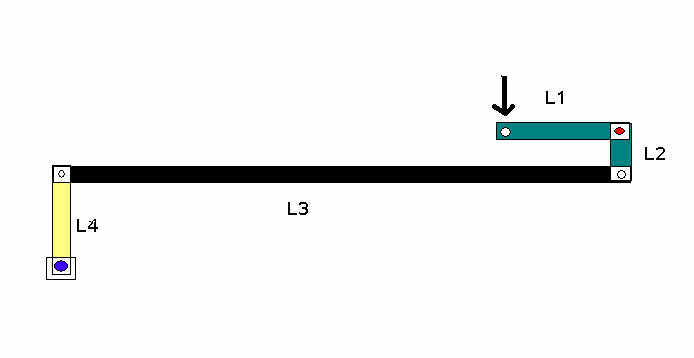 the length of the gear shifter is L4, and the effective moment about the blue center, or the turning force applied to the shifter shaft is: F2 X L4. F1 X (L1 X L4) / L2. let this be called result(1). now consider the "normal" case, where the gear lever was sitting directly on the shifter shaft. you apply force F1. the gear lever length is L1. so the turning force, or moment, at the shifter shaft is simply F1 X L1. let this be result(2). now compare result(1) and result(2). obviously result(2) is larger by a ratio (L4 / L2). now if L4, the length of the gear shifter, was say 8 cm - like we noticed on Haji's bike. and say L2 is 1 cm - as is roughly the case on a yamaha RX135 gear lever. then we are talking about a turning force increase of no less than 8 times when we convert to a linkage setup from a simple gearlever-directly-on-shaft scenario. so mathematically it was all damn obvious, and we wasted little time in moving onto such a configuration. sounds easy, but it took a bloody lot many number of trips to the welding shop, hero honda showroom (to get the CBZ gear shifter as well as the linkage rod), to the yamaha showroom (RX135 gear lever) etc. anyway so soon the bike is freed from the stiffer clutch springs, and the gear lever is sitting away from the shifter shaft and connected by a linkage rod fashioned out of the CBZ one. and of course, the gear shifter that we are using now, it's a good 8 cm long. these "simple" changes contribute so much, enough to call this as stage 9. we spend quite some time getting the gear lever angle, leverage, play, friction etc in place, and then head out to the tie-break testing session. to be brief, there is a very noticeable improvement in shifting quality. but tom does miss once. out of 6 runs, 5 runs went smooth and one run produced a gear miss. a plan is a plan and a rule is a rule so we decide to skip the mumbai drag. i admit that it wasnt a cold, machine-like, logical decision - both me and jaggu were just relieved and immediately slammed down our no-go approach. tom wasnt very happy, and tried pointing out that he missed only once etc. always human, arent we. anyway the majority prevailed, and that was that. o bike is good for 150kmph at the quarter - in the previous drag, even with a missed gearshift, it nudged 141.
o we probably fixed the gearbox long back - our issues were mainly with the clutch. so around this point onwards, the word "gearbox" slowly started slipping away from our discussions, and the word "clutch" started appearing more. o there seems be some kind of a "leak" in the engine. after that first run of 141, the next two runs - one by tom, one by me - were at 132 and 127 kmph respectively. we wondered if it was a head leak or an air leak etc. but there was a certian power loss, for sure. so once again we settle down for the next drag, considering our gear shift issues to be resolved. but looking back, this was probably the first time we sat back without being comfortably dumb. bliss, for a change, was not ignorance. and i can imagine Murphy throwing away his bag of tricks in disgust - and then, picking up a different bag. more on that later. o the stock RD front end would have to go. our friend Guru kindly offers an exchange for a pulsar front end. so we plan to pick it up and switch to a pulsar front shocks/wheel/disk - the full front end. o the clutch needs to be analyzed further. as mentioned earlier, we slowly started getting obsessed with the clutch. o do something about the stock RD tank etc. tom was insistent on this and suggested switching to a fibre tank. o do something about the aerodynamics - add a fairing. so our 2005 work starts soon, and this time we have hell a lot to do. as is obvious, the key target this time is weight reduction. at this point, we never really considered a power upgrade. but it would happen along the way, as time would prove. if i remember correctly, we pulled off the front end job first.